With more than 2.7 million trips in 2016 and 150k+ active customers, StadtRad is one of the largest bike-sharing systems in Germany. Taking the bike to get around can be both fun and convenient. 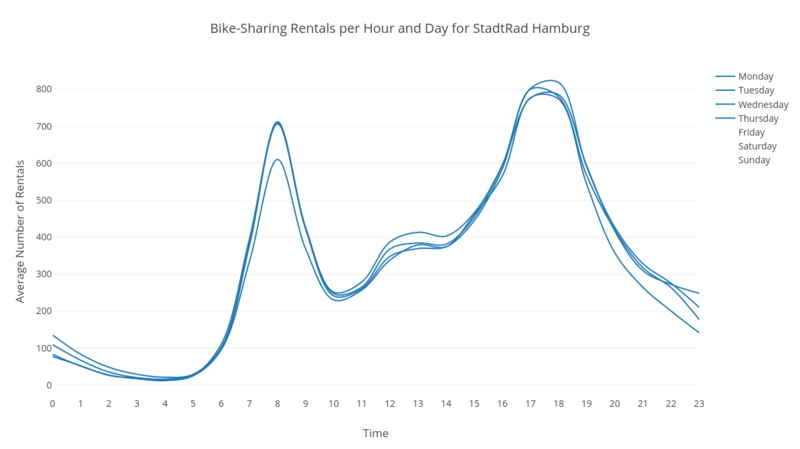 StadtRad is one of the most successful bike-sharing systems in Germany and operates in Hamburg. With more than 2.7 million trips in 2016 and 150k+ active customers, it is super popular. As the operator DB Connect publishes all booking data, we are able to identify potential customers and derive their travel patterns. And we do not need a lot of information to do this. The average number of bookings per hour and day is sufficient to derive key insights. Public transport and private cars are the most popular ways to get to work. 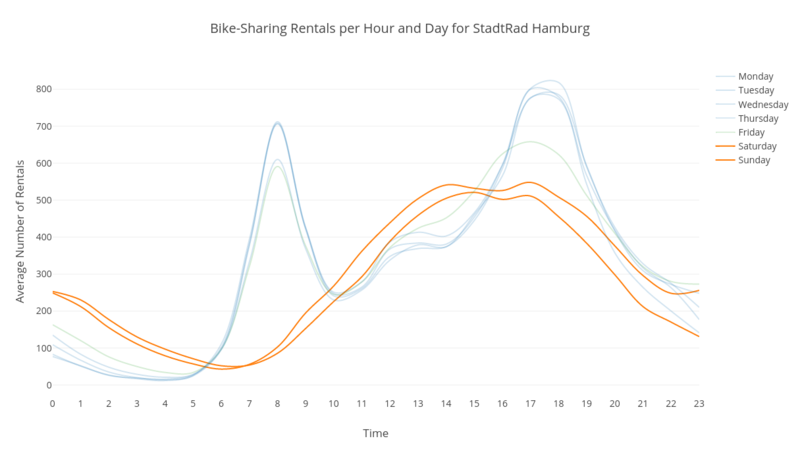 But there are also many people in Hamburg using a bicycle to commute to work or university. As such, we observe a peak in the rentals between 7 am and 9 am. Cycling on Monday mornings, however, does not seem to be the first choice. The average volume of bike rentals is less than during the following days. At 10 am rentals reach a trough and steadily increase until work is over for most people. Although the rental volume is low at that time, these rides last longer. From 4 pm it is getting busy again and rentals peak at 5 and 6 pm. But this does not last long as the rental volume decreases fast and remains below average during night hours. Employees tend to go home earlier and we see a much broader distribution of trips during the afternoon than usual. On average there are about 100 rentals less during both peaks than on every other weekday. The weekend starts on Friday night. Have a look at the early morning hours from Saturday and Sunday: During these nights rentals are significantly higher than usual. People go out, have fun and take the bike to go home. Especially in areas with many bars and clubs like St. Pauli we see a high demand for bikes. During the day, we see a much more stable demand in bikes. The average quantity of rentals steadily increases from the morning until it peaks in the afternoon between 2 pm and 5 pm. At the weekend popular places to rent a bike are along the Elbe river and in the Hafencity close to the Elbphilharmonie. Please note that rentals are slightly higher on Saturday. Especially on Sunday evening, we see the lowest demand during of the week. However, the overall pattern is pretty similar to Saturday. 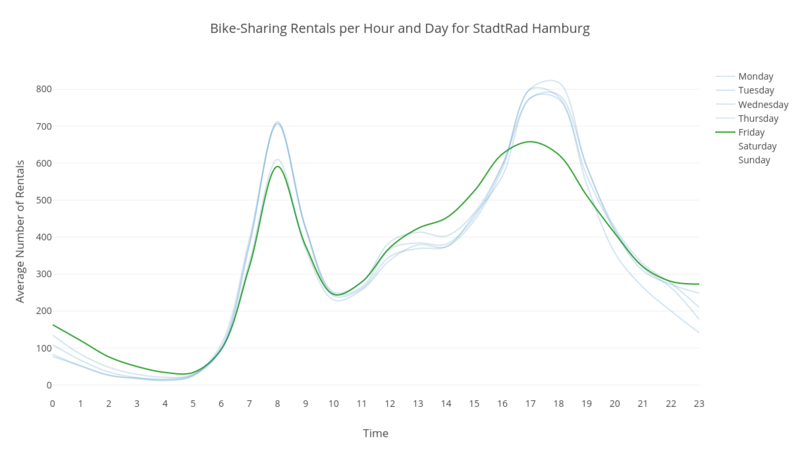 The peaks on work days suggest that many costumers use bike-sharing to commute to work or university. 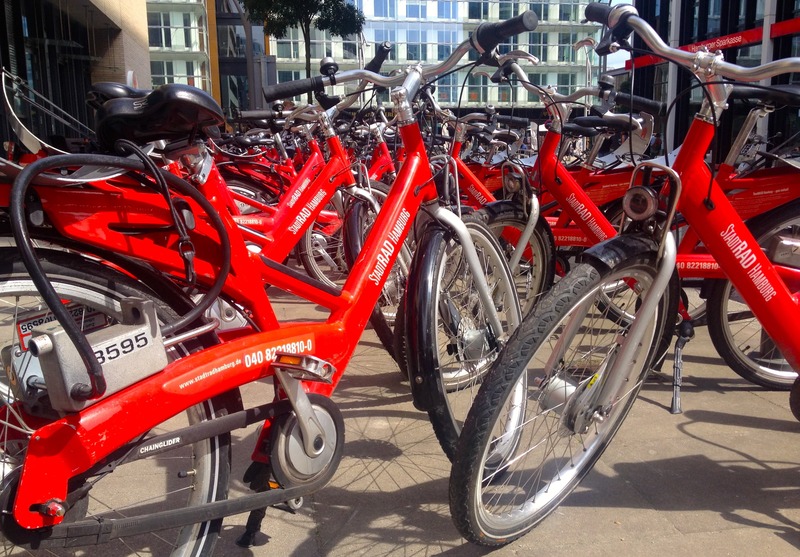 As bike rentals are higher during Friday and Saturday night, we suspect that bikes are also popular for young adults after visiting bars and clubs. The demand during the weekend might be explained by tourists who use these bikes for recreational and sightseeing activities.